The B-57 is a modified version of the English Electric Canberra which was first flown in Britain on May 13, 1949. In March 1951, the USAF contracted the Glenn L. Martin Co. to build the B-57 in the US under a licensing agreement with Britain. The Martin built B-57 made its first flight on July 20, 1953 and production ended in 1959, a total of 403 B-57s were produced for the USAF. The B-57 Canberra or “Night Intruder” was a medium jet bomber replacement for the aging Douglas B-26 Invader. The B-57B model was the most produced model and featured unique improvements like, having the crew members seated in tandem, a rotary-type bomb door with bombs mounted on the inner surface of the door and arming the B-57 with machine guns or cannons. The EB-57 was an electronic reconnaissance conversion of the B-57B used electronic jamming and chaff dispensers to avoid detection. This EB-57B S/N 52-1516 was last flown by the 158th Air National Guard stationed at Burlington, VT. Only 22 B-57Bs were converted to EB-57Bs. 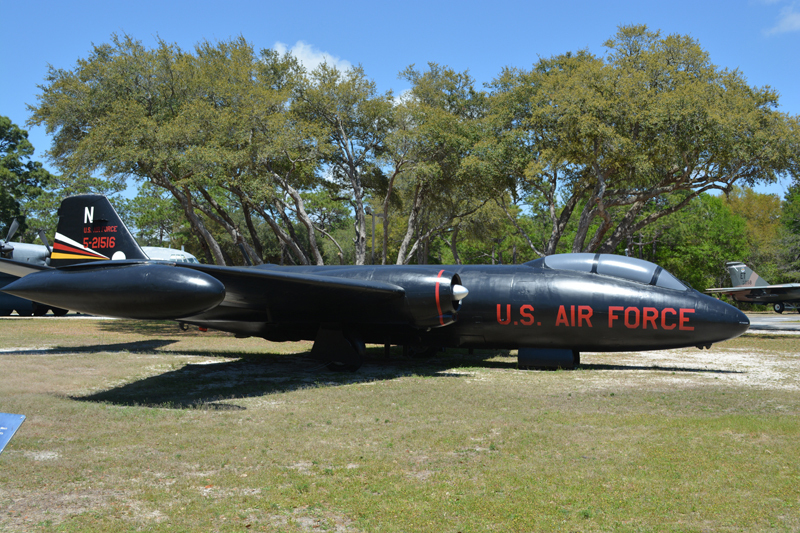 The B-57 saw service in Vietnam, out of 94 B-57s assigned to the Vietnam theatre – 51 were lost in combat. This aircraft is being depicted in its black “Night Intruder” paint scheme, as a B-57B assigned to the 8th Bomb Squadron, 35th Tactical Fighter Wing while stationed at Phan Rang AB, Vietnam.